If you like your carrots sweet, you can boil them directly in honey or if you don’t want them TOO sweet or want to be thrifty with your honey, boil them in water first till it’s just about at desired tenderness, then drain, add enough honey to coat bottom of pot and put back on to simmer. Stir so that all carrots get time to simmer in honey. Simmer at least 5 minutes but make sure all carrots get time in honey. 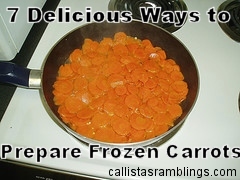 Put a thin coating of olive oil in oven-proof dish and add frozen carrots on top. Bake in oven at 350 until desired tenderness. If you are cooking something in oven, just add the carrot dish next to it at whatever temperature it’s at and just keep an eye on them. Saute carrots in your desired oil. This is better if you like your carrots to remain a bit crunchy. You can saute by themselves or with onion, garlic or the seasoning of your choice*. Cook them any way you want (boiled, sauteed or roasted) but then toss with some balsamic vinegar (about 1/2 tbsp per 1 cup of carrots) and brown sugar (1 tsp per 1 cup carrots) before serving. Have you ever had mashed carrots? Boil them long enough so that they are very soft and until water in pot is boiled almost all the way down. DON’T drain them or you’ll lose lots of nutrients. Take off heat, add butter/margarine and mash. Don’t add milk as you will have a bit of liquid from pot already. If you find they are too carroty, next time make mashed carrot-potatoes. Boil both and mash them together. If you like cheese, try making cheesy carrots. You can bake them and add shredded cheese on top in last few minutes of cooking or saute them and do the same. * Seasonings/Flavours that pair well with carrots: tarragon, ginger, parsley, cinnamon, orange, sugar, thyme, dill, butter, chili peppers, allspice, garlic.